Wired just published a conversation between neurologist Oliver Sacks and journalist Steve Silberman – the latter of whom is also now my neighbor – hello, Steve! – about music, memory, the neurological benefits and pressures of sound, blindness, and the (possible) dangers of urban noise pollution. 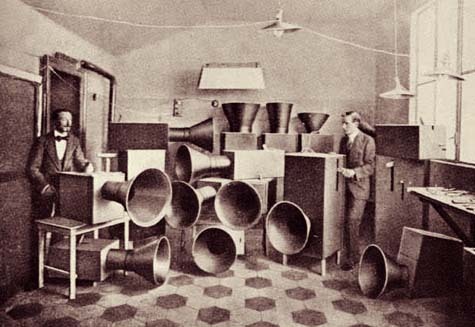 [Image: Luigi Russolo and his noise machines... something otherwise irrelevant to this post]. Wired: When you were growing up, hearing music often required going to see it performed. But iPods make music ubiquitous, like mental air-conditioning. What have we gained or lost by that? Sacks: At first it would seem to be a wonderful gain. Darwin might have had to go to London to see a concert. But I can't help wondering if the incidence of earworms and musical hallucinations is higher now, with background music in every public place. You can't go to a restaurant without music, and they get offended if you ask them to turn it off. They feel it's part of their creativity – they're doing it for you. The brain is very sensitive to music; you don't have to attend to it to record it internally and be affected by it. I think we may be exposed to too much loud and repetitive music. One patient of mine has epileptic seizures induced by music and has to wear earplugs in New York City. It's a dangerous place for him. For some reason, though, this reminds me of an anecdote I read five or six years ago about French minimalist/proto-ambient composer Erik Satie – about whom you can read more in David Toop's excellent book Ocean of Sound. So Satie, the anecdote goes, once tried to compose – and have performed, live, in a Paris restaurant – literal background music. It was music meant to flavor a room the way perfume might scent the boudoir: something you don't quite notice but is there nonetheless. Or, in a slightly more famous analogy, it was music meant to be experienced like furniture: it may be there in the room with you – but you didn't have to pay attention to it. It was just part of the design. In any case, social conventions of the time being what they were, whenever Satie's musicians, installed there in the restaurant, started to play, all the diners would stop talking, put their utensils down, and politely listen. That Satie anecdote is hilarious and wonderful, Geoff. Thanks! And thanks for the link. Don't miss Sacks' own annotated IPod list (though he doesn't own an IPod) -- his comments are marvelous. thank steve for putting this into print! sacks is a wonderful author and scientist. i had just read this article this morning and was excited to find he has a new book about a subject im greatly interested in - the ability of music to mold the brain.